Rotator cuff surgery is the repair of inflammation or tears of the rotator cuff tendons in the shoulder. There are four tendons in the rotator cuff, and these tendons are attached individually to the following muscles: teres minor, subscapularis, infraspinatus, and the supraspinatus. The tears and inflammation associated with rotator cuff injury occur in the region near where these tendon/muscle complexes attach to the humerus (upper arm) bone. 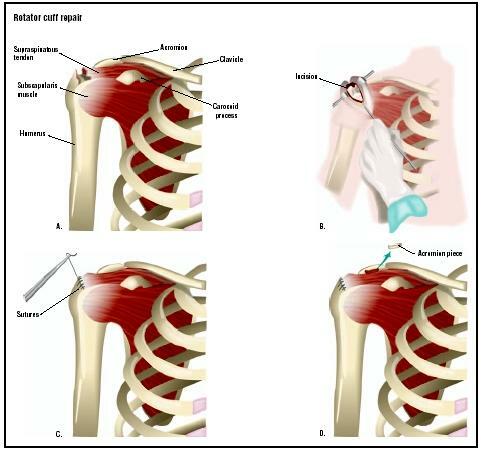 Rotator cuff surgery is necessary when chronic shoulder pain associated with rotator cuff injury does not respond to conservative therapy such as rest, heat/ice application, or the use of non-steroidal anti-inflammatory drugs (NSAIDs). Rotator cuff injuries are often lumped into the category referred to as rotator cuff syndrome. Rotator cuff syndrome describes a range of symptoms from basic sprains and tendon swelling (tendonitis) to total rupture or tearing of the tendon. Approximately 5–10% of the general population is believed to have rotator cuff syndrome at a given time. It is not commonly found in individuals under the age of 20 years, even though many in this population are athletically active. In general, males are more likely than females to develop rotator cuff syndrome and require surgery. Most rotator cuff injuries are associated with athletic activities such as baseball, tennis, weight lifting, and swimming, where the arms are repeatedly lifted over the head. Rotator cuff injuries can also occur in accidents involving falling to the ground or when the humerus is pushed into the shoulder socket. Rotator cuff injuries can also occur in older, active individuals because the rotator cuff tendons begin to deteriorate after age 40. Occupations that have been associated with rotator cuff injuries include nursing, painting, carpentry, tree pruning, fruit picking, and grocery clerking. For most patients, if the pain begins to subside, they are encouraged to undergo a period of physical therapy. If the pain does not subside after a few weeks, then the physician may suggest the use of cortisone injections into the shoulder region. Rotator cuff repair is then considered if the more conservative methods are not successful. The primary aim of rotator cuff repair is to repair the connection between the damaged tendon and the bone. Once this bridge is re-established and the connection between the tendon and the bone has thoroughly healed, the corresponding muscles can once again move the arm in a normal fashion. The goal of the surgery is to ensure the smooth movement of the rotator cuff tendons and bursa under the upper part of the shoulder blade. The surgery is also performed to improve the comfort of the patient and to normalize the function of the shoulder and arm. There are a variety of surgical approaches that can be used to accomplish rotator cuff repair. The most common approach is called the anterior acromioplasty approach. This approach allows for excellent access to the most common sites of tears—the biceps groove, anterior cuff, and the undersurface of the joint. Most rotator cuff repairs are accomplished using incisions that minimize cosmetic changes in the skin following healing. If possible, the surgery is performed with an arthroscope to minimize cosmetic damage to the skin. Typically, the incision made is about the size of a buttonhole. The arthroscope, a pencil-sized instrument, is then inserted into the joint. The surgeon usually accesses the rotator cuff by opening part of the deltoid muscle. If bone spurs, adhesions, and damaged bursa are present in the rotator cuff region, then the surgeon will generally remove these damaged structures to improve function in the joint. In cases where the arthroscopic technique is not advised or when it fails to achieve the desired results, a conversion to open surgery is made. This involves a larger incision and usually requires more extensive anesthesia and a longer recovery period. X rays are used to rule out other types of injuries or abnormalities present in the shoulder region. While x rays are often used to help solidify the diagnosis, arthrography , ultrasonography, computed tomography (CT), and magnetic resonance imaging (MRI) are the definitive tests in the diagnosis of rotator cuff injury. Arthography and ultrasonography of the shoulder can help determine whether or not there is a full tear in the rotator cuff. A MRI can help determine whether there is a full tear, partial tear, chronic tendonitis, or other cause of the shoulder pain. The final decision to repair the tear ultimately rests on the amount of pain and restriction suffered by the patient. Following the procedure, the patient will typically spend several hours in the recovery room . Generally, an ice pack will be applied to the affected shoulder joint for a period up to 48 hours. The patient will usually be given either prescription or non-prescription pain medication. The dressing is usually removed the day after surgery and is replaced by adhesive strips. The patient should contact a physician if there are any significant changes in the affected area once the patient goes home. These changes can include increased swelling, pain, bleeding, drainage in the affected area, nausea, vomiting, or signs of infection. Signs of infection include fever, dizziness, headache, and muscle aches. It often takes several days for the arthroscopic puncture wounds to heal, and the joint usually takes several weeks to recover. Most patients can resume normal daily activities, with the permission of a physician, within a few days following the procedure. Most patients are advised to undergo a rehabilitation program that includes physical therapy. Such a program can facilitate recovery and improve the functioning of the joint in the future. Complications following arthroscopic rotator cuff surgery are very rare. Such complications occur in less than 1% of cases. These complications include instrument breakage, blood vessel or nerve damage, blood vessel clots, infection, and inflammation. Complications, though still rare, are more common following open surgery. This is due to the larger incisions and more complicated anesthesia that is often necessary. The prognosis for the long-term relief from rotator cuff syndrome is good, especially when both conservative and surgical therapeutic approaches are used. In those patients who do require surgery, six weeks of physical therapy is typically instituted following surgery. Complete recovery following surgery may take several months. In rare cases, the rotator cuff injury is so severe that the patient may require muscle transfers and tendon grafts. Even more rarely, the injury can be so severe that the tendons are not repairable. This typically occurs when a severe rotator cuff injury is neglected for a long period of time. Morbidity is rare in both the arthroscopic and open procedures. Mortality is exceedingly rare in patients undergoing rotator cuff repair. Once the pain begins to subside, the patient usually is encouraged to begin a program of physical therapy to help re-institute normal motion and function to the shoulder. "Rotator Cuff Tendinitis." In The Merck Manual, edited by Keryn A. G. Lane. West Point, PA: Merck & Co., 1999. "Rotator Cuff Syndrome." In Ferri's Clinical Advisor, edited by Fred F. Ferri. St. Louis: Mosby, 2001. Schwartz, Seymour I., ed. Principles of Surgery. New York: McGraw-Hill 1999. Shannon, Joyce Brennfleck. Sports Injuries Sourcebook. Detroit: Omnigraphics, Inc., 2002. Welling, Ken R. "Rotator Cuff Surgery." Surgical Technologist 31 (1999): 4. Rotator cuff repair is generally performed by a specialist known as an orthopedic surgeon, who has received specialized training in the diseases and injuries of the musculoskeletal system. Orthopedic surgeons who perform rotator cuff repair receive extensive training in general surgery and in the specific techniques involving the musculoskeletal system. Rotator cuff repairs are often performed in the specialized department of a general hospital, but they are also performed in specialized orthopedic surgery clinics or institutes for orthopedic conditions. Can you recommend a surgeon who performs rotator cuff repairs? How many times have you performed rotator cuff repair? I'm not sure if I'm suffering from Rotator Cuff Injury, but I have been having similar symptoms to what I have been reading through this article. But I also have a stabbing, sharp pain in my forearm / palm (this is all in my right hand and arm). This is constant and is very painful and uncomfortable while using my laptop. My GP has put me on a course of 800mg paracetamol and to undergo 10 courses of physiotherapy, neither unfortunately have worked. I do hope you can advise. I fell really hard on my left shoulder and the injury kept me off work for a couple of days. When I went back to work I was able to perform my duties with minor pain. The following week as I went out to start my car I noticed my right tire was flat so I had to change it. I jacked up the car and used a four way to break away the lug nuts. As I pushed down on the lug wrench something popped in my left shoulder and the pain sent me to the ground yelling. I believe something was torn. I fell at work hard on my right side. I had terrible pains in my right shoulder/right hip and right side groin. An MRI showed I had a tear of my rotator cuff. I have been through P/T for 8 weeks and also had an injection. The pain level is better only because I don't use the arm for much. If I do the pain shoots up to 10. I was told I need the surgery. I still have a lot of pain in the groin and the Dr. thinks I might have opened an old hernia repair. After knowing 4 co workers that had the surgery, 3 of them are worse off than before the repairs. The 4th man was much younger and was very well built before the injury which may have helped. I don't think I will go through with the surgery till there are no other alternatives left. I have had a torn rotator cuff for 2 years now, I am 19 years old and do not know what to do. I dislocate it all the time and can not do alot of things because of it. I am scared to go to the doctor because I do not have health insurance. I know that I need surgery and I know it is going to cost alot. What should I do? I injured my shoulder/neck at work over a year ago. After fighting comp for over 7 months they finally allowed to have an MRI of the shoulder and it showed a full thickness tear in the rotator cuff. Already tried the usual cortisone injection which only made it feel worse, my doctor wants to try physical therapy first before requesting surgery. I dread the thought of therapy because just the simplest movement can cause extreme pain. I can't wait for surgery right now. My dad who is in his 70's has been through rotator cuff surgery 3 times, 1 on one side and 2 on the other side, his last surgery involved the use of a graft for repair, that was a year ago and he's been back to work for some time and doing fine, though he's finally taking it a bit more easy now days. had rotator cuff tendon repair, bicep tendon tear, 2 bone spurs,cuff tendon fused to bone with plastic clasp and screws drilled into bone. had a nerve block, woke in recovery room with severe headache still after six weeks headaches are debilitating. most of the times. what could cause this? been to a chiropractor little releaf. checked blood pressure, good. Does anyone know what they spent to get their rotator cuff repaired? My husband had a complete tear of his rotator cuff and suffered nerve damage. His surgery cost somewhere between 15,000 and 20,000. In addition he had physical therapy 3 times a week. It has been 4 months since the surgery and he still has limited range of motion in his arm due to nerve damage. He will have another surgery to try to replace the mylein sheath covering the streched nerves. Hopefully that works, otherwise he will never gain fullfunction of his arm. It's important to get your shoulder looked at as soon as possible, the longer you wait the worse the atrophy gets. I injured both shoulders in winter 2006 (rotator) had an MRI May 2006 waited 18 months for a surgeon with no response I had areferral from my GP to another surgeon who I had heard many good reports about.Her office called me in about 1 week and when I asked her why I was in her presence so quickly she informed me that my injury was severe enough in May 2007 to be done surgically, immeadiately, unfortunately the 18 month wait left 3 of the 4 tendons unrepairable I had the left shoulder done on Apr.12 /2010 so not to have the same outcome as the right shoulder.I suffered all the neck pain shoulder joint pain bicep pain I care to handle.I think I have an excellant surgeon and no longer suffer any pain to speak of but I do exercise caution when using my arms. I am lucky to be Canadian I paid 0 $ for the visits /surgery/ MRI's/ xrays and home nurses after the surgery at which time I was also supplied with all the pain medication I could possibily require even morphine and gravol, which I still have some left over I have paid for some water proof bandages so I could shower after physio which is also covered by my government health plan. DON"T wait if it needs repair find a good surgeon the loss of full use of your arms is far more costly!! pain pain go away...to wayne from previous article . know what you going through!fell getting into my gravel truck and basically severed my supra and infra spinatus muscles 3/4 tears full thickness and more. was an equipment operator/truck driver in off road oilfield work. wcb says its bruised !i finally get mri 7 months later and surgery at 11 months. but still numbness weakness pain immobility with increased activity. get another mri after i rolled heavy truck ,no apparent subsequent damage, but pain ten fold as often now. my doc says light duty and physio exs, wcb doc says heavy duty work approved ime says medium duty with restrictions. i tried going back to work and about 8 1/2 weeks and off again fighting with wcb, about pain,excess medicting to alleviate ,effects on and from driving tankers in oilfield,from steering on offroad conditiond , being left handed ,messin with 18gears,putting on chains,hauling 3in heavy fluid hoses etc. but they wont compensate me!!! no compo for pain they say, how bout stomach lining lesions from meds ? hmmm i'll let you know stillwaiting another scope! any buddy got info or help or proof for my issues? I had rotator cuff repair surgery almost 4 weeks ago. The acromium gap was 1 mm and using a surgical "grinder" the gap was expanded to about 10 mm. Fully torn supraspinatus tendon was attached as well as the 2 adjacent tendons which had partial tears. A total of 6 anchors were used, and the Doc said all looks well. Cause of tear was narrow gap and close to 30 years of surfing, which slowly frayed the tendon until it snapped. area with the aid ofy right arm. Doc says I should be surfing again by November. From these posts, surgery doesn't sound like any fun at all. How is your recovery going? I'm interested because it looks like i need surgery. An MRI of my left shoulder revealed 'subacromial spurring; supraspinatus tendinopathy; a tear in my subscapularis and AC joint degeneration'. Brilliant! I am a keen surfer and swimmer, but haven't surfed at all for 9 months. I know i'll be out of action for a long time to come with or without surgery but, will the surgery even enable me to surf properly again? Thanks to everyone on this site for sharing their experiences! I tore my rotator cuff in 2008 at work and went on workmans comp. The dr gave me shots in my shoulder and gave me pain meds and therapy. After about 6 months he released me with my pain the same as when it started he said i did not need surgery but now 2 yrs later i'm stuck with this pain and can't afford to go to the dr. why didn't he help me? What can i do? I recently had my 2nd surgery for full thickness tear of rotator cuff-Left side. Was almost healed and had a freak accident and ripped it apart again. Can I just yell you the pain with surgery.Open invasive surgery twice. I have been on pain medd since the 1st surgery on July 7th. My last surgery was Sept. 7th. I went to a pain specialist to help me with the pain because Ortho Dr. only covered my pain for 1 week. Anyway, then ask Pain Specialist to help wean me off these pain meds when the pain was tolerable. He said he applauded me. It only takes 3 weeks to become addicted. So, can't sleep, or get comfortable, and no appetite. Wondering if anyone else has a similar story to share. can force that shoulder to move and it will take you to your knees. Ice and meds are my friend . I had surgery on my shoulder 2 months ago and still pain omg so much pain. Working on 3 months of thero and my range of motion is thier but the pain in umbareable. I can't sleep still can't do anything above my head still alot of pain. I'm out of ideas. I don't know if I should go for a second option or at this time if I'll ever get my arm back completely . Any ideas more than happy to listen. I had rotator cuff surgery March 2010, and after 7 months of PT.. I do have full use of my arm again. However, it was the most painfull rehab... the stretching exercises hurt like h---, but eventually the arm did stretch. I still have pain once and awhile... and some soreness.. but all in all it feels good, and I am glad that I had the procedure done. So there is light at the end of the tunnel. Be patient. I just hope the other shoulder holds out. Not ready to do this again so soon. I have have my left rotator cuff repaired 7 weeks ago.I still have lots of pain from my shoulder down to my fingers. I can be very still and I get this serge of pain down my arm and I don't ever move it. It feels like it will never get better. I still have to wait an other 7 weeks to see my specialist because of changes a the Hospital. Missing driving! Had rotator repair and bone spurs removed on the right side in 2007 and had several months of therapy..complete torture! My range of motion is good but the pain has never completely gone away. Now I have a tear on the left side and am facing another surgery..not looking forward to it at all. The doctor from my previous surgery said I make too much scar tissue. Trying to sleep is all but impossible with both shoulders like this. I have been to two other doctors who suggested more therapy. The problem is they don't seem to listen to me when I say range of motion is NOT a problem and therapy only make it hurt worse. Any one else having that problem? Surgery third time.i am nervous. I had the surgery Aug 27 and still having pain! Surgen says not normal need to come back and see him. After reading all posts I am scared. I am a commercial driver, right arm right handed, I cant drive. Hope all goes well!! I had pain in my shoulder and upper arm. I read a lot of the stuff out there and after several months finally got in to see a specialist got a cortizone shot was sent to a physical thearpist and "boom" done. Did not need an MRI but did have X-ray done by general practice doctor before being sent to the specialist. Slow stretching the arm was they key and the thearpist massaging the shoulder worked a miracle after two visits. Good luck to you all. It is great to be pain free. my husband is waiting for surgery but it seems a bit iffy as surgeaon says tendon hascompletely become detached and the 8 month period means the tendon might have strunk back completely and will therefore unattachable. what does this mean. will my husband have limited movement and pain for the rest of his life. Had subscapular tendon reattachment surgery 6 weeks ago after tendon pulled off following shoulder replacement surgery done 4 months ago. Still having swelling and pain in the inner aspect of the bicep muscle which has been present since the replacement surgery. Anyone else had this problem & if so what causes it and what can be done to resolve it? My shoulder surgeon says that the constant pain that I've been in is due to a torn rotator cuff and a torn labrum. I've decided to opt out of getting anymore nerve blocks because they simply don't work for me, and plus I've had some horrible experiences with having one. any advice would be great. Two years ago I fell from about 6 1/2- 7 feet in the air and landed on a wooden gym floor. I had problems for months after. Eventually it all went away. Now all of the sudden I had a really severe pain in my neck and now it's in my shoulder, and partially my arm (all at the same time). I couldn't move my head when my neck hurt 5 days ago. I yet again have tingling in my arm and fingers and some numbness. This was normal when my injury first happened, but it went away and hasn't come back this severely before. I don't know what to do. I've been reading some websites and saw the school nurse, they all say the same thing. Then I read if these symptoms don't go away surgery is possible. I'm only 16 and I'd rather not have issues with arthritis and/or a bad surgery. I'm terrified and don't know what to do. I need advice ASAP!! My aunt is recovering from shoulder surgery (one side). I'm not sure if she is using the surgery to control me, or if she really does need help with daily activities (e.g., carrying a cup of water). With that being said... What limitations should be expected from someone who just had shoulder surgery? I seem to have found a lot of information on how people take care themselves, which makes me question the "care taking" expectations that she has set for me. I'd appreciate any feedback, thanks! Had all the same thing to me also, still have bisep pain therapy makes it hurt bad. Did you get better? I had rotary cuff surgery in November 2013 on my left arm. It was horrendous. It was so painful for such a long time. I had a cortisone shot before surgery and that made it worse. I also had therapy before and after. I still have bad pain in BOTH shoulders which gets worse at night. It's very hard to get any sleep. I still am on pain medications. I can't take anything but Aleve for swelling. This is not fun. Having a total knee replace 10 months later didn't help either. I also get injections in my back due to 4 herniated discs. They can't do surgery because my spine won't handle it. I am so sick of pain as I'm sure you all are too. I wish each and every one of you a successful surgery and a quick and complete recovery. I have an injured shoulder, and have never experienced such severe pain in my entire life. The MRI was excruciating..why, I don't know. I'm waiting to hear my shoulder specialist now. I'm confused about the severity of the pain and the nausea that goes along with it...anyone else experience this? I had rotator cuff surgery Sept.14,2015. The rotator was over half torn and so was repaired. Have been in physical therapy twice a week since then. Some movement has improved but the overhead backward and backward at my side will not move. It is extremely painful. Pain is getting worse at shoulder and down to my hand. Pain is increasing more every day and cannot sleep. It does not feel right. Have tendon snap also at elbow and wrist that was not there before surgery.A block was placed under my rotator during surgery because it was also weak. That area is also increasing in pain.I saw the physician assistant today and he was very angry and said it is a painful surgery. This pain is worsening daily and is always present. I see the surgeon in followup in 6 weeks if I make it that long. Do not think this is normal and am going to ask for x- ray from family doc if does not improve before long. I was denied an x-ray by the physicain assistant today. I am afraid I may be injured by the "agressive therapy" the PA recommended today.I do not think everything is ok .Feel for all of you on this forum. If you had major rotator cuff surgery only three weeks ago, you should probably still keep your arm in a sling and only be moving your arm from the elbow down gently, with no lifting and not behind you at all. I had major RC surgery 13 weeks ago,(3 complete tears) and physio is only now starting to get me to move my arm unaided and still barely backwards.Premature use could be what is part of your spasm (nerve) problems. Lifting anything much heavier than a cup of coffee is still painful, but apparently is quite normal at this stage. I too had rotator cuff surgery on Sept 16, 2015. I was in a pillow sling for 6 weeks, doing pendulum and wrist exercises twice a day. At 6weeks I started PT and the range of motion went well.. Hurt like heck when the PT stretched me, but with ice and a little time the pain would go away. At 2 months I started strengthening with the thera band and a soup can ( or 1 lb. weight ) and that is when the pain started. It goes down my arm through the elbow and down to my hand. Dr. doesn't have anything to say about that , even though I told him at my last 2 visits. My PT said she thought we were aggravating a nerve with the exercises. I need some relief as it hurts constantly and when I try to use my arm it hurts so bad I need to take some pain pills. What do I do ? I had rotator cuff surgery 10 weeks ago. Now I have a soft lump on my incision what could this be? I had rotator subscapularis tendon repair(acute) from a fall on my right arm(dominant). Was repaired almost 6 months ago. I was told I would be fine and I would be able to lift weights again. Six months later my arm hurts sleeping the most every night, and all day long if I don't take Aleve. I barely can lift 3 to 5 pounds, I cannot open heavy doors or list anything more than 10pounds. Had the best surgeon at Greenwich hospital. I have been going to Physical therapy since late April, its now end of September. I have not progressed as I was told. I have had other surgeries on my knee, back, ankle and hips before. This surgery was worst in anyone's lifetime. Has rendered me pretty much disabled. I reported pain in my right shoulder in jan 2016 and the pain continued after January. every time I saw my PCP she gave me voltatren gel for my shoulder it was some kind of cream to rub on it. I had another apt in sept with pcp where I was still hurting and my right shoulder started popping, I could not raise it, can.t reach behind me, sleep at night etc. I had a MRI done oct 10 and guess what I had a tear on my rotator cuff. the MRI was sent to my pcp and she sent to it a place called Andrews institute the dr was unable to see how much of a tear I had on my shoulder. so I have to do another MRI and I sit here still unable to raise my arm and do any other activity. I even can't write without hurting at all I am miserable. I was out on pain med called tramadol to slow the pain down but it does not help me. the med just make me sleep is all it does. I do not know what is going on but I am thinking my insurance is holding back. I cannot use the er but I been tempted to do it anyway. can anyone tell me will this get worse due to the wait for treatment, will I need surgery? or will I have a permanent disability? the doctor cannot do anything for me until I do a second mri at this time. I suffered an injury May 2015 while at work to my shoulder. After seeing a ER doctors and then clinical physician I was sent to see an orthopedic doctor. He tried injections and physical therapy. Neither one worked so he order a MRI with contrast. I was diagnosed with a S.L.A.P tear. Surgery was scheduled and he did not repair the tear he just detached the bicep tendon and placed it in the bicep bone. I started physical therapy and was doing well. My surgery was July 31. In September I fell and caught myself with the injured arm. There was a loud pop and excruciating pain instantly. Went to the ER and 5 days later had a MRI without contrast. The MRI showed I had a tear. The surgeon that was caring for me ordered a MRI with contrast it showed there was changes to the rotator cuff. I developed frozen shoulder after my second injury and in December had a manipulation surgery. Went through therapy for several months from the first injury to the second injury. I still was symptomatic but the doctor said there was nothing left he could do and released me with permanent lifting restrictions. I was able to receive a second opinion and this doctor ordered another MRI. I was told again I had rotator cuff tear and it was a deep tissue tear. He ordered surgery and it was finally approved. I had surgery yesterday and he said he did not repair the rotator cuff because there was no tear. He never actually came and talked to my boyfriend and I to tell us what he did or why he didn't do what was originally discussed. He finally agreed to talk on the phone to my boyfriend and said that he scraped something off so there was more room for my shoulder to move and rotate. I just want to know how accurate a MRI is and if this sounds a little off. I understand that not all test are 100% accurate but three MRI's said there was a tear. Hi just had rotor repair done arthroscopically but anchors did not hold in shoulder bone. Just had x-ray this am and doc was upset my shoulder bones did not hold in place. In 10 days to two weeks he wants to attach tendons to upper arm bone. Has anyone ever been through this or heard of it? I am a 47 year old (right handed) female who lives alone. I have had severe right shoulder pain for almost 2 years. The left shoulder isn't pain-free by any means. I had several courses of PT and OT, and several cortisone inj's. Each injection worked wonders... for about 3 months that is. This time around, I suddenly had more and more pain after it wore off. Usually, the pain returned gradually. I had an Arthrogram in Aug of 2017 (I cannot have MRI's due to a graft stimulator in my hip). The test was "outright" negative. Show no leakage of joint fluids or tears. I did PT a few more times but it continued to be excruciatingly painful. I had lost a lot of rotation and degree of movement. My ortho dr gave me one more inj while I waited to get in to see a shoulder & elbow surgeon. At this point, there were never any tests that were positive. So they diagnosed me as having Rotator cuff Syndrome. When I saw the surgeon Pre-Op, she concluded that this would most likely be a cleanup, go in get out surgery. Most likely 2, maybe 3 weeks max in a sling. I was all settled with that, for once, a very pessimistic me, overcame and told myself it'd be nothing so don't fuss to worry about what-if. Knowing that 3 ortho Drs and radiologist techs never saw "anything wrong", I was convinced easier. Last week, June 21, 2018, I went in for a diagnostic Arthroscopy. When I woke up, I found out that the surgeon "was shocked" to find a "very large tear". She ended up having to perform rotator cuff repair and bicep Tenodesis. That was way more than I even thought of. I thought rotator cuff those 2 years. I had never in my life even heard of the words tenotomy or tenodesis. Well, I am glad they found and repaired what was needed but I am very discouraged... and actually scared now. I see my surgeons assistant for my initial Post-op appt in 3 days. Then, I hope to find out what this entails. I now, most definitely know this won't be only a 2-3 week process, as previously thought. Here goes.